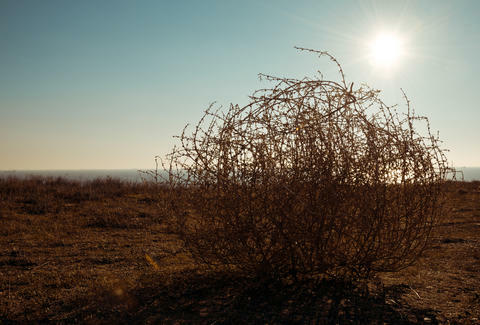 The standard movie scene involving tumbleweeds features a timely piece of brush illustrating how isolated our hero is in the most clichéd way possible. A much more exciting movie would be the true story of the Southern California town of Victorville, which was buried in a deluge of tumbleweeds on Monday. The brush flood was so bad that residents called 911, and as many as 150 homes were affected, Victorville spokeswoman Sue Jones told the Daily Press. Victorville is apparently bordered by nothing but open desert to its east and south, which is bad news when wind storms come and the desert moves right into town. Winds reached up to 60mph and tumbleweeds piled up to the second story of some houses. Victorville basically looks like a prop closet. You honestly kind of have to see this to believe it, so check out the tweets below to get a sense of how bizarre this truly was. And maybe start on that screenplay: The Flood of the Tumbleweeds: The True Story of Victorville, California.